Some like sci-fi, while others does not. The Hunger Games is a huge roller coaster since its very beginning and spans the genre from violent teenager movie to a serious drama sci-fi. The movie saga started off as a Battle Royal copy more or less. It brought lots of images on how Capitol looks like, but the main focus was those kids and teenagers which had to fight in the arena to be killed for the fun of it. The second film which came out was way more interesting for me and it gave us all much more look into the different Districts in the movie. The second film also had kids and teenager killing, but way less.. and the ending is for me very epic. Now in Part one of the Mockingjay revolution, the movie turns a lot and it becomes a sci-fi drama rather than a teenager killing movie… The only thing. It seems like they have forgotten its action-role part. Did I like what I saw? A big Yes!.. but also a tiny No! The Hunger Games Mockingjay Part 1 is just mind-blowing when it comes to actors, scenery and the near detailed showing of the devestated Distritcts. This movie shows us how the war have destroyed the Districts and give a emotional view of how the refugees in the reminding districts lives. How they struggle to survive and how they actually start to work against the dictatorship. It gave me really huge goosepumps all over my back, as this movie put the politics too far and manages to make this film to a much more drama movie than a sci-fi movie. Some of the sequences are calm, but I wished that there was more view of the Capitol in daytime. More view of everything in daytime as I have been so exited to see it since the first and second The Hunger Games movie. I hoped that the important scenes came to light and that drama scenes weren’t too long, but I was wrong. There are some superb effects in the movie. Especially the night view of Capitol gave me Tron Legacy thoughts,.. but I feel that I wanted to know much more about things in this world more, rather than drama which also includes a cat! It turns it to something it isn’t and some Hollywood movies tend to think that this is a too easy solution for making people its okay,.. but it is not. Not for me and not for lots of people whom I’ve been talking to. I came out of the cinema with a positive feel all in all, but this movie could have be so much more. 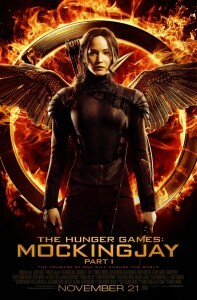 Jennifer Laurence shows her skills in this movie. She have matured, and so have all of the other actors. But the movie keeps me not satisfied. It keeps my questions of the whole dictatorship still be alive. I want to know more about Capitol. I want to know more about everything actually… Sooo… I just hope that Part 2 of this Mockingjay series will end in a way that my heart can fall asleep.